Andrew Kim Taegon Previous (Andrew Johnson)Next (Andrew Marvell) Saint Andrew Kim Taegon Saintandrewkim.jpg Saint Andrew Kim Tae-gon Born August 21 1821 Died September 16 1846 (aged 25) Venerated in Catholic Church Beatified 1925 Canonized 6 May 1984 by Pope John Paul II Major shrine Chŏltusan (Martyr's Mound), Seoul, South Korea Feast 20 September (Roman calendar) Patronage Korean Clergy Saint Andrew Kim Tae-gon is known as Korea's first Roman Catholic priest. Born into a family of Christian converts at a time of unprecedented governmental opposition to Christianity (Christian teachings threatened the hierarchical system of Confucianism and ancestor worship), Kim and his family led lives of deprivation and hardship. Although there were repeated efforts made by the Korean monarchy (who feared European colonization of Korea through Christianity), to uproot the religion of the barbarian foreigners from 1794 to 1866, converts to Christianity continued to increase. 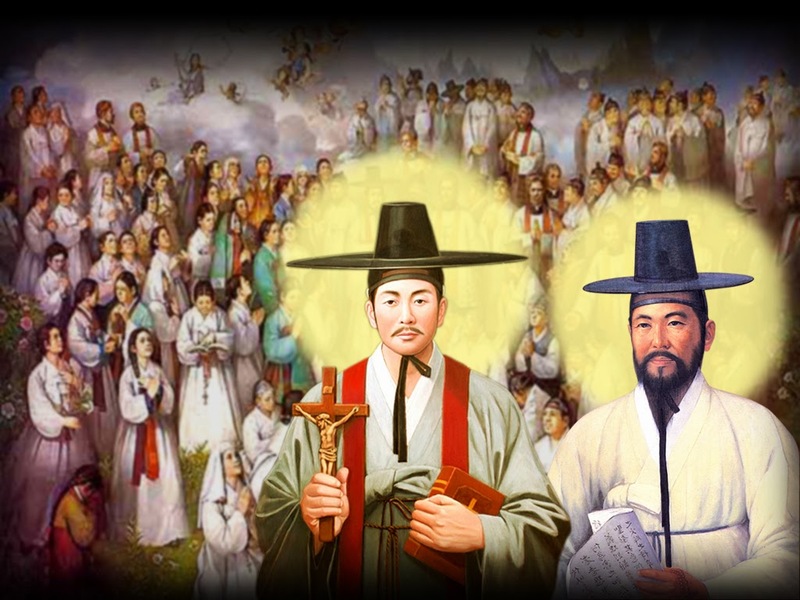 Even though Kim's family members and eventually Kim himself would suffer persecution, torture and eventual martyrdom under the repressive Korean monarchy, as it desperately tried to preserve itself and Korea's Confucian culture by eradicating Christianity; the sacrifice of these early Korean Christians became the foundation for the Christian Church in Korea to flourish today. Andrew Kim Taegon is revered today for his sacrifice and dedication in bringing Christianity to Korea. During the 1592 invasion of Korea by Japan, Japanese soldiers introduced Christianity into Korea by baptizing Koreans. A Japanese commander, Konishi Yukinaga, took a Korean girl, Julia Ota-a to Japan and she became one of the first Korean Christians. Father Gregorious de Cespedes, a Jesuit priest, visited Konishi in Korea in 1593. Korean diplomat, Yi Gwang-jeong returned to Korea from Beijing bearing several theological books written by Matteo Ricci, a Jesuit priest living in China. Some two centuries later, members of the Silhak (practical learning) school were drawn to Christian thought because it advocated a social structure based upon merit rather than birth rank. Most early Christians had family ties to the Silhak school. During the late Joseon Dynasty and under its Confucian influence, Christianity was heavily suppressed and many Christians were persecuted and executed. Kim Taegon was born into this environment, and just one of several thousands of Catholic, Presbyterian, or Methodist Christians who were tortured and executed because of their faith during this time. In 1866, Regent Heungseon Daewongun (father of King Gojong) signed a decree to execute all Catholics. Over 2,000 Catholics were beheaded at Jeoldusan, "Beheading Hill." Their bodies were thrown into the Han River. Some were as young as 13. Fewer than 40 were identified. At this time, Korea was isolated from the world; the only outside contact being with Peking, where taxes were paid. Jesuits in China managed to smuggle Christian literature into Korea. When Korea saw its first missionaries arrive from France and America in the mid 1800s, several thousand Koreans were already practicing Christianity. Andrew Kim Taegon was born in Nol-Mae (Solmoe), Chu’ung-Chong Province (in South Central Korea. At the age of seven, the Kim family moved to Golbaemasil Mankok-ri, Youngin-gun County (Mirinae) Kyungki Province. Kim’s great-grandfather, Kim Jin-Hu was martyred in 1814. Kim’s grand-uncle, Kim Han-hyun was also martyred in 1816. Kim’s father, Kim Je-jun (Ignatius Kim), was subsequently martyred in 1839 for practicing Christianity. With so many male relatives martyred, Kim grew up very poor; his mother reduced to begging. After being baptized at the age of 15, Kim traveled over 1200 miles in 1836 to study at a seminary in the Portuguese Colony of Macau, China. He returned to Korea through Manchuria. That same year, he crossed the Yellow Sea to Shanghai, where he was ordained a priest in 1845 by the French Bishop, Jean Ferréol. He then returned to Korea to preach and evangelize. These grueling trips between China and Korea, on foot and by small unworthy fishing vessels, allowed Kim to explore the terrain and increase the accuracy of the maps he had been using to plan better routes for the French missionaries to infiltrate Korea. "My dear brothers and sisters know this: Our Lord Jesus Christ upon descending into the world took innumerable pains upon and constituted the holy Church through his own passion and increases it through the passion of its faithful....Now, however, some fifty or sixty years since holy Church entered into our Korea, the faithful suffer persecutions again. Even today persecution rages, so that many of our friends of the same faith, among who am I myself, have been thrown into prison. Just as you also remain in the midst of persecution. Since we have formed one body, how can we not be saddened in our innermost hearts? How can we not experience the pain of separation in our human faculties? However, as Scripture says, God cares for the least hair of our heads, and indeed he cares with his omniscience; therefore, how can persecution be considered as anything other than the command of God, or his prize, or precisely his punishment?...We are twenty here, and thanks be to God all are still well. If anyone is killed, I beg you not to forget his family. I have many more things to say, but how can I express them with pen and paper? I make an end to this letter. Since we are now close to the struggle, I pray you to walk in faith, so that when you have finally entered into Heaven, we may greet one another. I leave you my kiss of love. On September 26, at the age of 25, Kim was tortured and beheaded near Seoul on the Han River. His ears were pierced with arrows; his face covered with lime. A group of Christians led, by Yi Min-Sik, later moved his body to Mt. Mi-ri-nai, about 35 miles from Seoul.